Maasai herdsmen in Kenya have turned to an age-old contraceptive device, the "olor", to protect their precious goat herds from an ongoing drought. 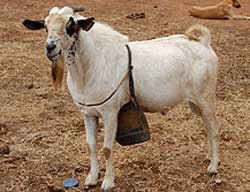 The olor is made from cowhide or a square piece of plastic, and is tied around the belly of the male goat. It prevents the bucks from mating with the female goats. The herdsmen are using the device to limit the goat population and ensure there are not too many animals grazing on sparse vegetation. "We don't want them to breed in this drought," says Mr Ole Ngoshoi Kipameto, a goat owner in Kajiado district.